A: My name is Effie Beachy and I live in Smyrna, DE. Q: Take us back to your life before joining Breakthrough. A: I would work 8-12 hour days then go home and sit in a recliner. I’d try yo-yo diets and workout on and off making me feel bad all over again. Q: Why did you end up choosing Breakthrough? A: I was impressed with the personal attention everyone got in the training sessions. Q: What was your first impression of Breakthrough when you first joined? A: I thought, “They really have my best interest at heart.” Chris knew exactly what I needed to start out with as far as my workouts. And they noticed and celebrated my progress each month. Q: How is Breakthrough different from other programs you’ve tried in the past? Breakthrough is made up of people that truly care for you and call you by name. Q: Walk us through your journey and where you are now. What changes have you made, benefits you’ve experienced, results you’ve achieved? A: I finally know what good nutrition is! I read labels now, but I mostly make and eat foods that don’t have labels. I’ve lost 20 plus pounds, lost inches and body fat, and feel 100% better! No more limping when I get out of a chair, feeling swollen, or hurting hips and knees! My name is Joyce Denman and I’ve been with Breakthrough since May of 2017. 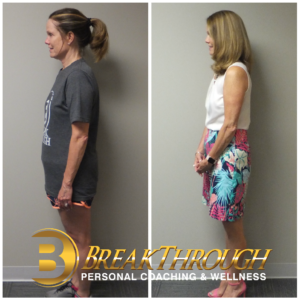 Before joining Breakthrough, I knew I had been gradually losing fitness levels but just couldn’t seem to make the commitment or find the motivation I needed to change my habits. My work routine was hectic and planning for meals seemed exhausting. There were frequently events or something at work that would provide irresistible temptations. The cumulative effect of eating on the run, working through lunch, and late hours really creeps up on you over time. It’s gradual and you are always saying in the back of your mind, “I’ll fix this tomorrow …” but those tomorrows string together and soon you have months or even years of neglect that make the task of getting started even more daunting. When I was at an LRP conference with my colleagues Tonya and Sylvia they talked me into signing up for the LBD (Little Black Dress) challenge that was starting the next month in May (2017). I must have been in the right frame of mind because something just snapped and I said ,”Okay, let’s do this!”. There were others that I knew through work that were also signing up for this challenge so we had a good support group in the work place. In my first week at Breakthrough I was impressed and annoyed by the level of attention. I was impressed because it was obvious to me that the people really cared and had my success as a priority. However, I was annoyed because I could see I was not going to be able to hide from anybody if I would choose to make bad decisions! 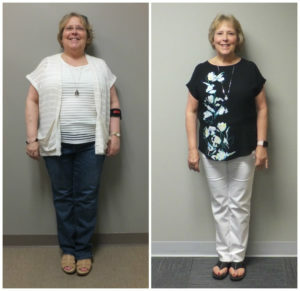 By the end of the project, 6 weeks, I had lost 13 pounds! I was coming to training sessions twice a week, but it was clear that the nutrition was the root cause for my weight loss. I decided to continue with Breakthrough as a member, because I knew that without that extra motivation piece, I was likely to slip back into old habits. 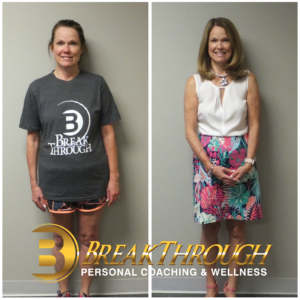 Even though the nutrition was the main thing, the frequent meetings with Breakthrough and the opportunities to discuss and share kept the “Mental” piece of the puzzle in place. Without that mental motivation, I have a history of not staying the course. After one year at Breakthrough I’ve experienced so many changes! In May of 2017 I was diagnosed as pre-diabetic which prompted my general practitioner to encourage me to lose weight. I AM NO LONGER PRE-DIABETIC! I had also been taking cholesterol medication for over 15 years, as of 6 months ago I am no longer on meds and my numbers have stayed favorable. Lastly, my closet is getting a complete overhaul. None of the clothes I was wearing last year at this time fit anymore. I have lost a total of 50 pounds! I am stronger, more flexible, have more energy, eat better, am more confident, have become a fighter, and feel better about myself inside and out!!!! I joined Breakthrough on March 4, 2016. 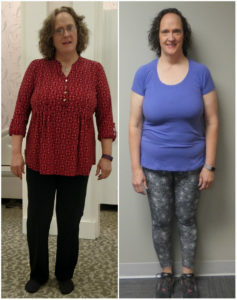 After working out at the YMCA, doing Zumba, and Kickboxing and losing 35 pounds on my own, I hit a plateau and wasn’t losing the additional 50 pounds the doctor advised me I had to lose. I was pre-diabetic, had high cholesterol and was considered level two obesity. I was on a downhill spiral and going back to the way I used to eat due to a life changing event causing depression. I needed to make a change and invest in myself! Hiring a personal coach was my best choice – I needed the support both mentally and physically. 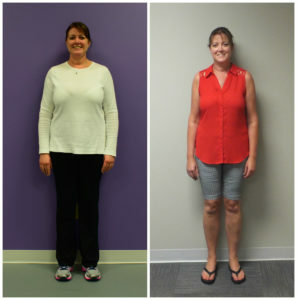 After researching available options, I found Breakthrough Personal Coaching & Wellness in Dover. 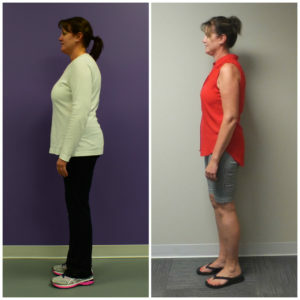 After speaking to Chris at Breakthrough and learning about the types of “Workouts” they offered – and understanding that there would be no exercise equipment involved such as bikes, treadmills, or ellipticals, (all of which I was bored with), I knew this was the way to go for me to get “Fit” – I was sold! Thinking about my first visit/workout had me scared I wouldn’t be able to do it or keep up with the others. I had always worked out with close friends, but lost that means of support when I moved back to Smyrna several years ago. I knew I wouldn’t know anyone at Breakthrough and this was out of my comfort zone – I was completely taken off guard by how friendly and supportive everyone was. I was impressed with all the screenings Chris did to determine how my workout should be structured so I would achieve the best results. 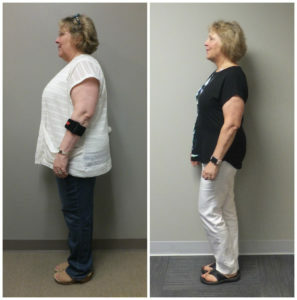 I have never heard of a color band system before, (having to clear one band to advance up into the program) but it made sense – and the system gave me something to work towards at a healthy pace. I knew this was a new beginning that I needed. I LOVED IT!! I took the first nutrition class available to help me get back on track and I got into a weekly routine of food prep every Saturday for the entire week. My life is a grab and go environment, so this works perfectly. Most importantly – I started caring about me again!!! After being in the program 7 months another life changing event happened. I was laid off after 29 years and was diagnosed as being a full diabetic. When the nurse called me with the blood test results and said I needed to start working out and go on a low-fat diet, I almost screamed! I was working out 2 hours a day and already on a low-fat diet. Why wasn’t my body accepting what I was doing? Having extra time on my hands I started working out at the gym even more. I met with Chris and asked him for help with the diabetes – I refused to go on medication. I only had 3 months to get my diabetes under control before the doctors were going to put me on medication, Chris suggested the Little Black Dress diet – and it WORKED! I beat the diabetes and lost 9 pounds! The doctor was ecstatic and said I was on a better diet than what they had given me. I have been able to beat the diabetes for 7 months now and lost 16 pounds. I know, and the doctor agreed, that by continuing this routine the rest of my life – will allow me to continue beating the diabetes going forward. The support and guidance you receive at Breakthrough, no matter what your situation is – will help any person that wants or needs the help. I love my 5 A.M. workout family and my yoga sessions. I have had more success at this gym than all the other efforts and activities I have ever tried. I would recommend this gym to anyone, no matter what health or physical restrictions you have. You must remember it’s not about the number on the scale, its how you feel, and the fat loss. As Chris says, throw the scale out!! In May I will be with my daughter as she gets married on the beach in Florida. My intention is to lose the additional weight requested by the doctors and wear a beautiful dress three to four sizes smaller than when I started my journey. I will continue to challenge myself to beat the diabetes, keep gaining extra confidence, and strive to be the strongest, healthiest, and happiest person I deserve to be. I started with Breakthrough over a year ago around March 2015, I believe, based on an ad that offered a free trial. I was looking for a small gym that met the hours I needed. I came in and met with Chris who inquired about my fitness goals which were the typical: lose weight, tone up, and get fit. But what struck me as different was he put me through the functional testing to gauge my physical limitations so that I wouldn’t get hurt when working out. What I found out was just how out functionally out of shape I was. All the things I thought I could do, I couldn’t. I knew this in the back of my mind because I had been struggling for over 8 years with bad knees, having had multiple arthroscopic surgeries and now my hips were also failing but until the testing I had brushed it aside. My orthopedic doctor said I needed hip and knee replacements as soon as possible or I would eventually not be able to walk. 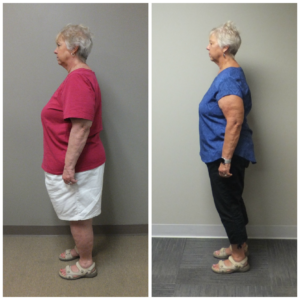 Shortly after joining Breakthrough, I had a left hip replacement. I came back after 6 weeks and Chris modified my workout to accommodate newer limitations while encouraging me to do as much as I could. The 4pm workout team was very supportive and as I grew stronger, I could do more things but was still limited because of my knees. In 2016, I took time off from Breakthrough to have both knees replaced at the same time. I came back after 8 weeks and again, Chris modified my workouts to help me increase the strength in my legs. When I went back to the orthopedic doctor 6 months later to have a mid-year recheck he was very pleased with my progress of being able to do squats and have more functional movement in my legs. However, he also felt that I would not improve much more than where I was at. That set me on a mission and I have been determined to get to the top of my game in with my lower body, so I now not only do corrective exercises at Breakthrough but at home too. 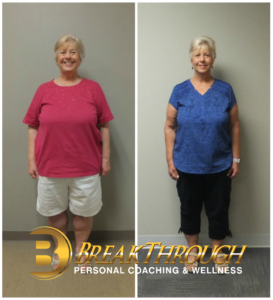 I am not where I want to be, currently working on hip flexor and shoulder movements, but I am a long way from where I was when I started with Breakthrough thanks to Chris and the Breakthrough team. I know I wouldn’t be where I am today without Breakthrough. Chris, Karen, Krista, and Jim have been extremely supportive as I have embarked on this journey to be able to move like a normal person. I am so grateful for the 4pm team that consisted of Patty Shirey-Pierson and several others, as well as the 6am team of Kim, Jane and others. We encourage each other while improving our individual selves. 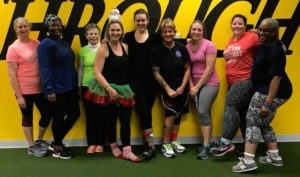 Breakthrough offers a lot: fun personalized challenging workouts, community service, nutrition, various challenges, and they even send birthday and Christmas cards to each person. 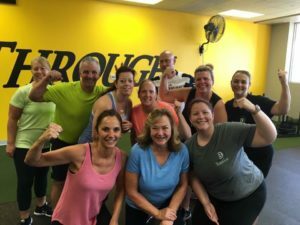 Breakthrough is definitely not your normal gym. Breakthrough is a family that I look forward to coming to see and be with a few times a week. My recent success began when I was invited and accepted into the “Breakthrough Fitness Family”. I previously felt like I was broken; and I didn’t know where to begin, or even believe that I could possibly put the pieces back together. My downhill slide began very gradually and comfort food slowly became my best friend, so I thought, which allowed me to eat myself into a very unhealthy state. I was diagnosed with thyroid cancer, and that was only the start of numerous health hurdles; such as, hypothyroidism, hypertension, depression, hearing loss, vitamin D deficiency, and the worst – kidney failure. Prior to joining the “Breakthrough Family” my last visit to the nephrologist, wasn’t so good, she was quite concerned about my weight gain and pleaded with me to lose just 1 pound before my next visit. My kidneys couldn’t handle the excessive weight, so she prescribed a third hypertension medication. 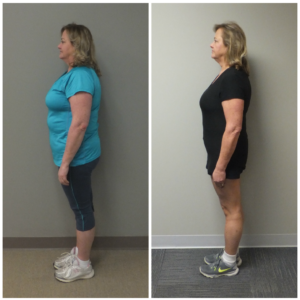 I left her office very depressed and had a full book of excuses as to why I couldn’t lose weight, hypothyroidism, bad knees, and no time to work out with a full time job. Fortunately, my path crossed with an old friend, who filled me in on Breakthrough. 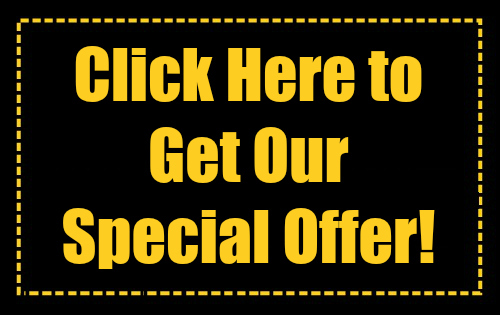 I followed her link on Facebook and at that time Breakthrough was offering a free trial. So, I took a deep breath and started with one small step forward by signing up and taking advantage of the free trial. It only took a few days to realize my new “Family” truly cared about me and put my needs first, coaching and guiding me into a new routine that has ultimately transformed my life. Their support, guidance, and patience has allowed me to shop from the back of my closet! I honesty never thought I would ever fit into those clothes again. My short adventure and small success with my new “Family” has allowed me to regain my confidence and overcome a life full of obstacles. I’ve realized my new friends are real people just like me, bonding together, there to lean on and to support each other every day, every workout, and every challenge. Breakthrough is an amazing place with an interesting name. I would imagine we all have our own interpretation of “Breakthrough”. To me, it’s a unique name for a remarkable organization, with an awesome family behind it. One which has welcomed me with open arms and given me the tools and guidance to enjoy life to the fullest. April 10, 2017 marks my 6-month anniversary at Breakthrough. If someone would have told me 6 months ago, that I’d be where I am today, I literally would have laughed out loud. I was 186 pounds and struggling to get myself into a size 14. I wasn’t active at all. I hated the way I looked and the way I felt. I knew I had to do something, but lacked motivation. I had struggled with my weight for over 30 years, trying many fad diets, only to gain the weight back, plus some. One day I happened upon an advertisement on Facebook about free Yoga for 30 days, so I decided to check it out. A few days after my first class, I got a call from Chris Gray. He wanted to know how I liked the Yoga class. This is the first time in my life that a gym owner took the time to reach out to me. We started talking and he convinced me to come try out his program for free. I could try it to see if I liked it, no obligation. So, I thought what could it hurt, right? I was skeptical in the beginning, because I know myself. I know that I have never stuck to any gym or workout regimen and I am a true foodie at heart. I love to cook and love to eat even more. But in the back of my mind, I also knew I had to make a change, a LIFESTYLE change. So, I went to the gym to meet with Chris. 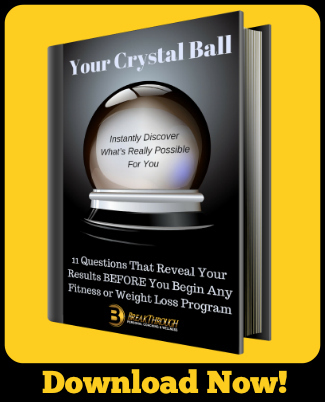 I was impressed by his methodology, of focusing on not just weight loss, but FAT Loss, muscle gain and strength. Fast forward 6 months later to today. I have lost over 31 pounds, but I have gained muscle and strength. I have biceps! LOL. Currently down to a size 8. I have learned how and WHAT to eat through the Nutrition Academy. I still love to cook and eat even more, but now I cook healthy whole clean foods. I am very lucky to have a supportive husband who has embraced our healthier lifestyle and encourages me constantly. If you are on the fence at all about Breakthrough Personal Coaching and Wellness, I urge you to come to the gym to talk with Chris Gray. You have nothing to lose, except FAT, but what you will gain is immeasurable. Breakthrough truly focuses on your Mind, Body and Soul. 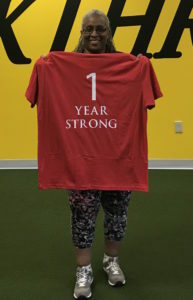 My health and fitness journey is not over, I am excited to see what is yet to come!